John Lester Hubbard Chafee was born Oct. 22, 1922, in Providence, Rhode Island to a politically active family. His great-grandfather, Henry Lippitt, was a Rhode Island governor and among his great-uncles were a Rhode Island governor, Charles Lippitt, and United States senator, Henry F. Lippitt. In 1940, he graduated from Deerfield Academy in Massachusetts. He received degrees from Yale University in 1947 and Harvard University law school in 1950. Chafee served in the Marines during World War II, spending his 20th birthday on Guadalcanal. In 1951, he was recalled to active service to be a Marine rifle company commander during the Korean War. Mr. Chafee became active in behind-the-scenes Rhode Island politics by helping elect a mayor of Providence in the early 1950s. He successfully ran for a seat on the Rhode Island House of Representatives in 1956 and later became the minority leader. He was reelected in 1958 and 1960, the latter a year when many Republicans were swept from office in his state. Mr. Chafee was elected governor in 1962, helping create the state's public transportation administration as well as what was known as the Green Acres program, a conservation effort. Mr. Chafee was head of the Republican Governors' Association in the late 1960s. He was appointed as Secretary of the Navy in 1969. His tenure as Secretary was marked by a willingness to make bold decisions and stand by them. Emblematic of this was his decision to elevate Adm. Elmo Zumwalt as Chief of Naval Operations over 33 more senior officers, and his judicious handling of the USS PUEBLO situation. He served as Secretary of the Navy until 1972. Mr. Chafee, elected to the Senate in 1976, served as chairman of the Senate Committee on Environment and Public Works. He first joined the committee in 1977 and made environmental matters a chief concern, often breaking with his party to the delight of conservation groups. "His fingerprints are over all the major environmental legislation passed in the last 20 years," said Darrell West, a professor of political science at Brown University who studied Rhode Island politics and interviewed Mr. Chafee last year. Among the bills Mr. Chafee fostered while in the minority was the Clean Water Act of 1986, the 1990 amendments to the Clean Air Act. He also was an architect of the Superfund program in 1980 to clean up hazardous waste sites as well as the Oil Pollution Act of 1990. Frequently following a moderate path, Mr. Chafee was pro-choice on abortion and supported the North American Free Trade Agreement. "John Chafee proved that politics can be an honorable profession," President Bill Clinton said in a statement to the Associated Press. "He embodied the decent center which has carried America from triumph to triumph for over 200 years." Mr. Chafee sat on the Select Committee on Intelligence and was chairman of the Senate Finance Committee's Subcommittee on Health Care, but his biggest imprint was on environmental concerns. "He was a pillar of strength defending environmental protections against the erosion being called for by the leaders in his own party, for example, protecting wetlands, defending the Clean Water Act," said Brent Blackwelder, the president of Friends of the Earth, an environmental advocacy group. "Whenever you needed a defender and you looked to the Republican Party in the Senate, he was the No. 1 Republican leader," Blackwelder added. "This prevented a world of damage from being done, so the American public owes him debt of gratitude." Blackwelder also was a squash partner of Mr. Chafee's until the senator stopped playing about seven years ago. "He was a vigorous man," Blackwelder said. His last major act was authoring and sponsoring the Transportation Equity Act for the 21st Century, which authorizes funding for transportation programs for the next six years. Survivors include his wife, Virginia Coates Chafee, of McLean and Warwick, R.I.; a daughter, Georgia Nassikas of McLean; four sons, John Jr., of Los Angeles, Lincoln, of Warwick; Quentin of North Kingstown, R.I.; Zechariah of Providence; three sisters; and 12 grandchildren. 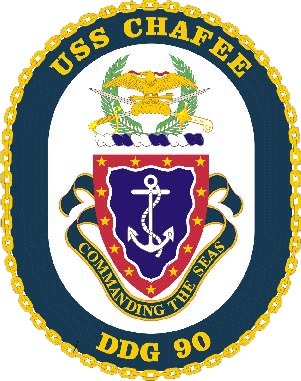 Seal: The coat of arms is in full color as in the blazon, all upon a white background and enclosed within a dark blue oval border edged on the outside with a gold chain (strength) and bearing the name USS CHAFEE at top and DDG 90 in base in gold letters. The Shield: Dark blue and gold represent the U.S. Navy. The thirteen stars symbolize the thirteenth state, Rhode Island. The anchor is derived by the Secretary of the Navys flag, a reference to John H. Chafees distinguished service in that appointment (1969-1972). The scarlet border denotes sacrifice and courage, attributes demonstrated many times by the Senator as a Marine and as a political leader in his state. 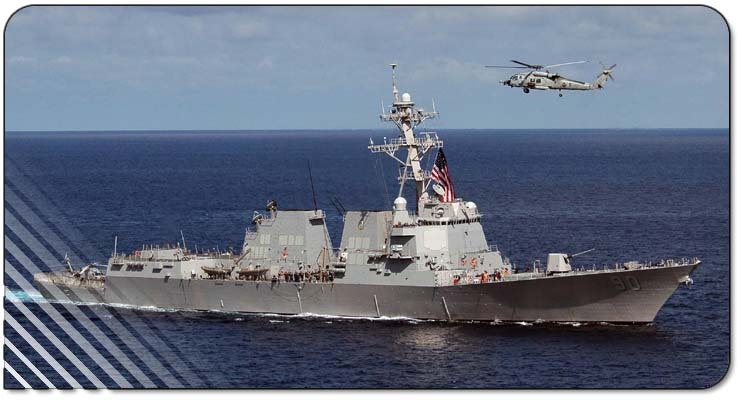 The bordure is wavy, referring to the Navy and the mission of DDG 90, which in part undertakes to protect the maritime interests of the United States. Argent (white) denotes integrity, Or (gold) signifies excellence. The Crest: The swords symbolize Senator Chafees distinguished service in two wars, the many decorations he was awarded for his combat participation and the readiness of DDG 90 to engage in battle. The Marine Corps mameluke represents his service to the Corps. The laurel wreath, symbol of honor and achievement, recalls the Senators service to his country as a Marine, public official and three times Governor of Rhode Island. The eagle refers to his role as Secretary of the Navy. Scarlet and gold signify respectively courage and excellence.